This post is sponsored by The Home Depot. All opinions and ideas are my own, of course, and I am thrilled be working with one of my very favorite companies! I love being outside. In fact, the outdoor living areas of my house feel just as important to me as the indoor. I love creating a comfortable, useful place to relax, entertain, and hang out in the sunshine just out the backdoor. 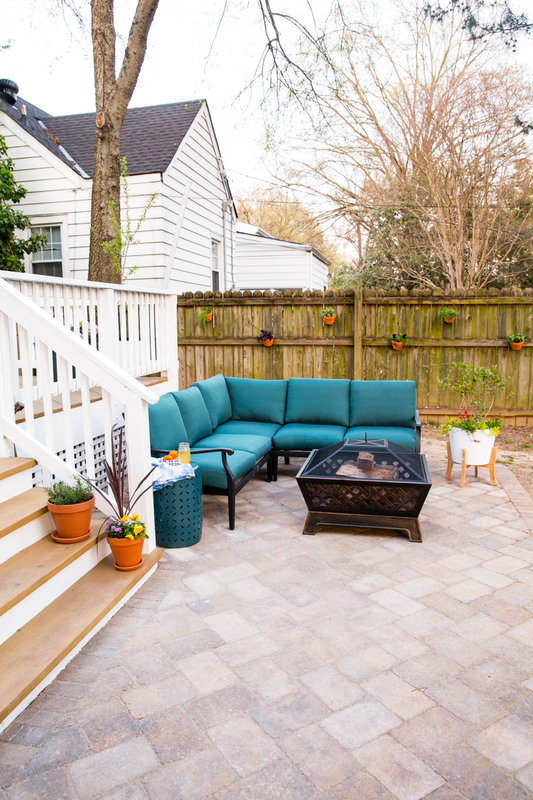 Adding a hardscape like a DIY paver patio to the backyard instantly adds an intentional outdoor living space for patio furniture, a fire pit, barbecue, or whatever else you want! 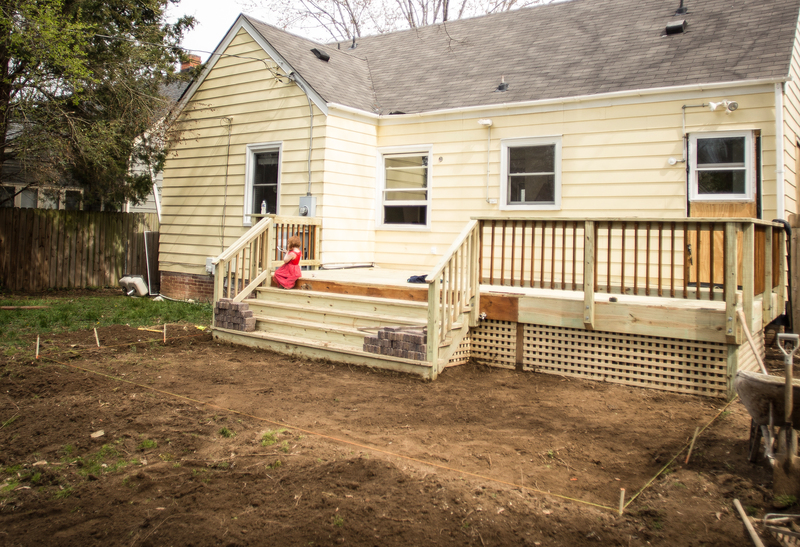 Our new fixer upper in Richmond had a cute little wooden deck, but no hardscape at all. And– I mean, the outdoor area needed a little love. My vision for the yard immediately included a nice, paver patio at the bottom of the deck steps, extending the living space, and creating a home for our awesome patio sectional and fire pit from The Home Depot. 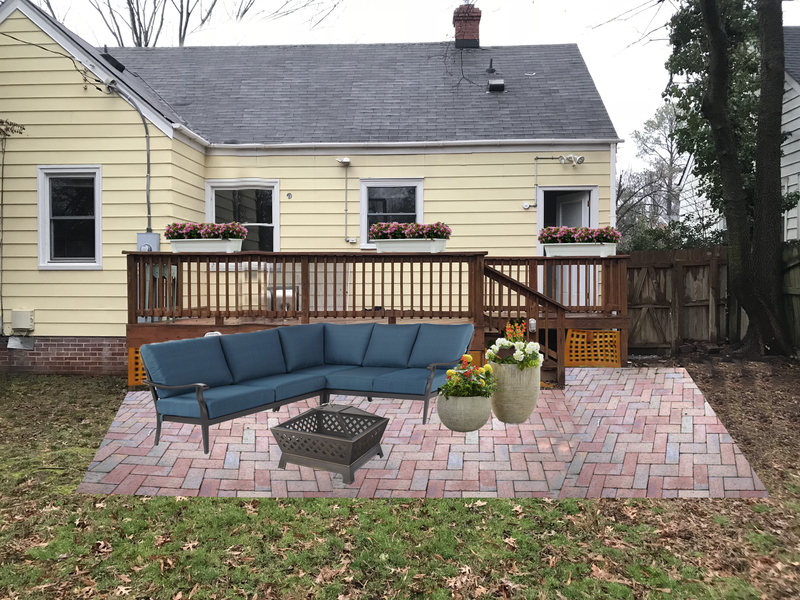 When I was invited to participate in The Patio Style Challenge with The Home Depot, I proposed this awesome DIY Paver Patio to really transform the space. Of course, I made a mock-up rendering of what this might look like, and sent it to the team at The Home Depot. It makes me giggle now, because I had a bit of a vision, but nothing compared to how the space actually turned out! 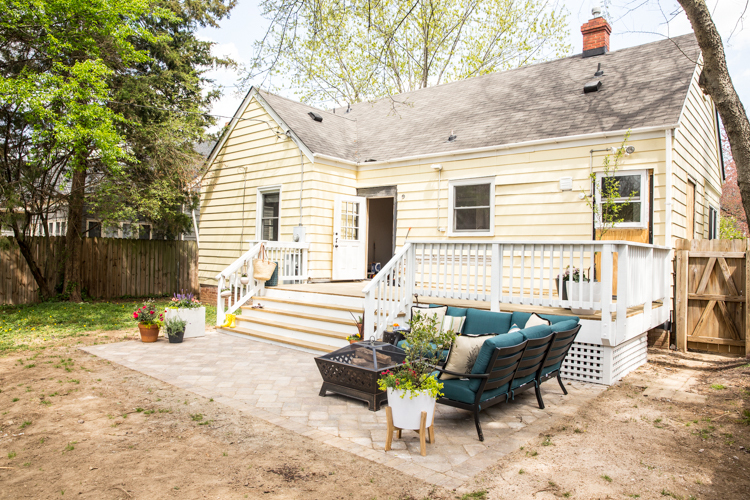 I loved partnering with them to work on this area of the yard, and also really enjoyed making a full DIY video to show the process from start to finish. The more I thought about it, the more it made sense to change the orientation of the deck before adding the DIY Paver Patio, so that the flow from the house would go straight into the yard. 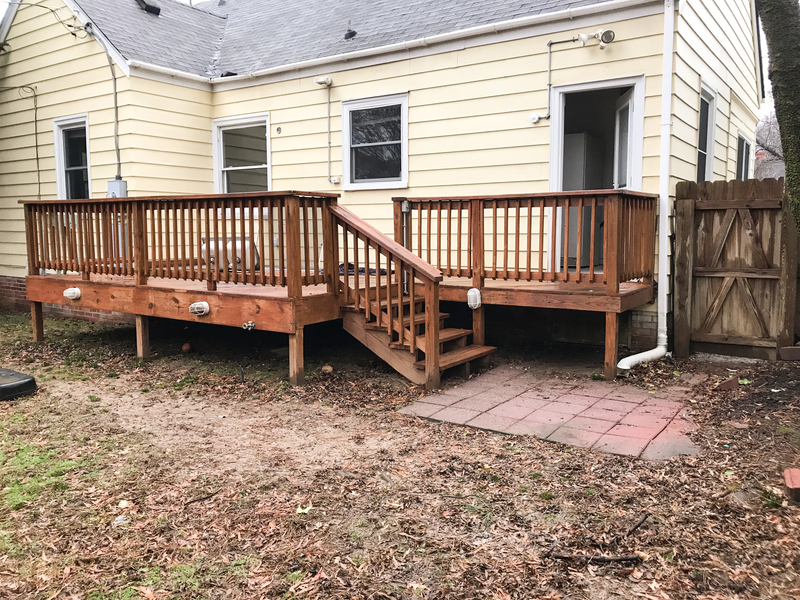 We not only changed the stair orientation, but also rebuilt most of the deck itself. Finally, we were ready to add the DIY paver patio. I hired a local paver team to help me install the patio, with the agreement that I would be hands-on and involved the whole time. 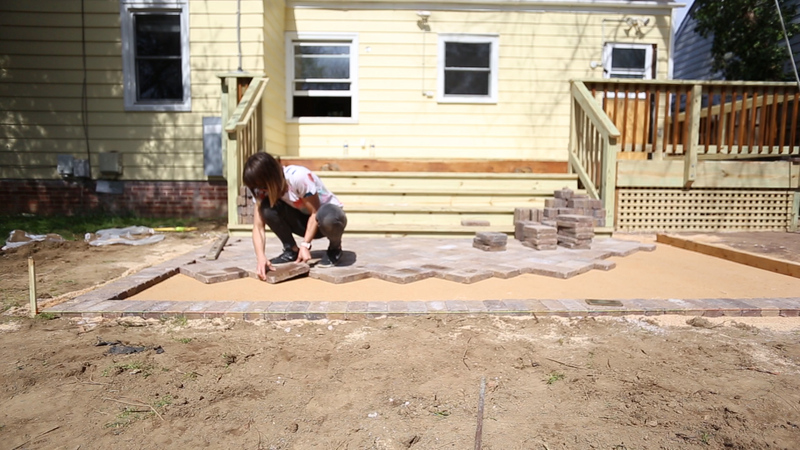 I wanted to not only install the patio, but do make sure the process was as professional as possible. I was also on a deadline and needed it to be finished in 2 days flat. They were amazing with really teaching me the ropes, and laughed that I would never have to hire them again because I learned exactly how to install the pavers for the next time. I will definitely be referring to my own post and video for when I gear up for my next DIY paver project! I shared the full step-by-step blog post over on The Home Depot Blog. 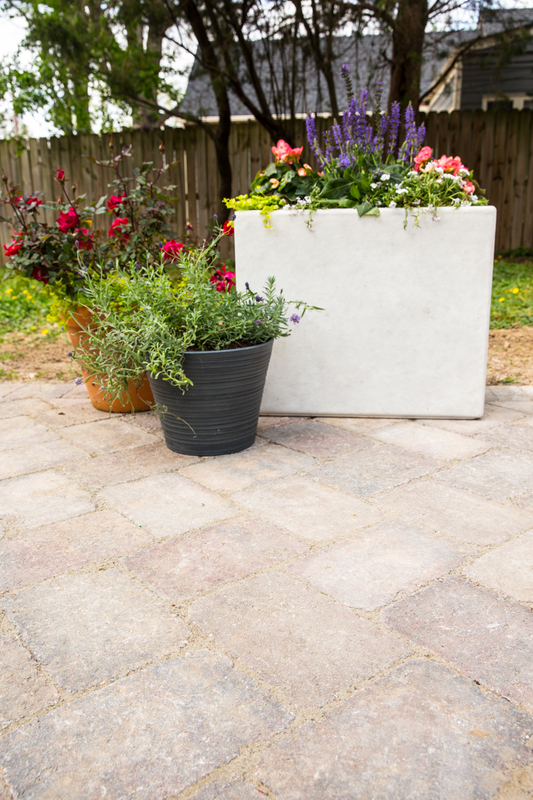 Installing a DIY Paver Patio is one of those projects that feels a little overwhelming before you begin, but as you dig in (literally) you realize that it is straightforward. The digging, sanding, and laying are each fairly simple, just require some muscle and time. Cutting and installing the pavers on a herringbone pattern added some technique and tools to the job, and I love the way it turned out. If you feel overwhelmed by the cutting, however, I would recommend to stick with a square pattern and just eliminate that piece of the project! Our new paver patio is like an oasis in a still fairly unkempt yard. We have lots of work to do on the landscape, but have created one very intentional and beautiful space where we can hang out! I love it so much. We between the deck and the paver patio, plus all of the plants and furniture we have added, the back patio has felt like a finished space, which is really amazing when the rest of the house has been torn apart for months. I has become our primary entertaining space, where we have already hosted several barbecues, and have a neighborhood s’mores night coming up! As soon as the grass seed all around the pavers begins growing again (and the siding on the whole house is replaced…) this whole place will be just as I imagined. It already is one of my favorite places. If you have been on the fence about adding a paver patio to your yard, let me give you the push to make it happen! You will love having a space built into the yard to turn into a real outdoor living space. It is like adding square footage of usable space to your yard! Follow along with the simple steps I shared in this post and this video and create the space you’ve been dreaming of!